Penguins are not big fans of Flash, that’s for sure. But they are a little out of touch and sometimes need a reality check. This reminds me of the old days when you had to do a little dance to get Linux to show the floppy disk icon on the GUI desktop. All I know is, I’m gonna have to go out and buy another 1024 CPU’s to test this new capability……..NOT!!!!! As a website designer, (A bad one at that), I have always spent hours making my sites look absolutely perfect. Finally done, satisfied, and ready to move on, I hesitantly take a look at how it looks on other browsers and versions. It is then I curse God, Microsoft, and Steve Jobs! Back to the drawing board. There have definitely been days when I simply wanted to tell Explorer users and Apple users to upgrade to Firefox, in the end I go back and redo it all over again. 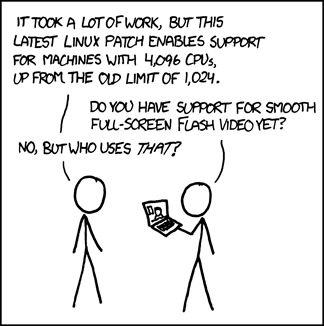 Ya, Linux is definitely not the operating system for the masses. Really outside of programmers and software engineers, I’m not really all that sure who would even use a Linus machine. I hesitantly take a look at how it looks on other browsers and versions. Great!Your blog is unique, the website is good information I am sincerely admiring your capability to respond in a short time with such constructive advices. We shall be eagerly waiting around. Thank you for you hard work. wonderful blog! keep up the good operate!